DVD of the Month - "Metropole Orkest: Better Get Hit in Your Soul"
CD Reissue of the Month - "Allan Holdsworth: Hard Hat Area"
Recorded & Mixed by Allan Holdsworth. Originally mastered in 1993 by Bernie Grundman. Originally offered in very limited print and distribution, this great effort has been remastered and repackaged in digipak format (with intriguing new liner notes provided by Barry Cleveland, also) -- finally receiving the marketing and distribution it undeniably deserves. While the music on "Hard Hat Area" may seem a logical extension of the sophisticated, highly idiosyncratic style of jazz-fusion that Allan developed on his previous seven albums, it possesses a major difference: it was recorded by the guitarist's touring band, which had refined the material by performing it live before entering the studio. The album was recorded on a 32-track Mitsubishi digital recorder at Front Page Recorders in Costa Mesa, California, not far from where Holdsworth resides. Overdubs and mixing were done personally by Allan at his home. The natural sum of the preparation, performance and recording processes is a more seasoned, organic feel. A truly superb album, from one of progressive music's all-time greatest treasures -- available, once again. 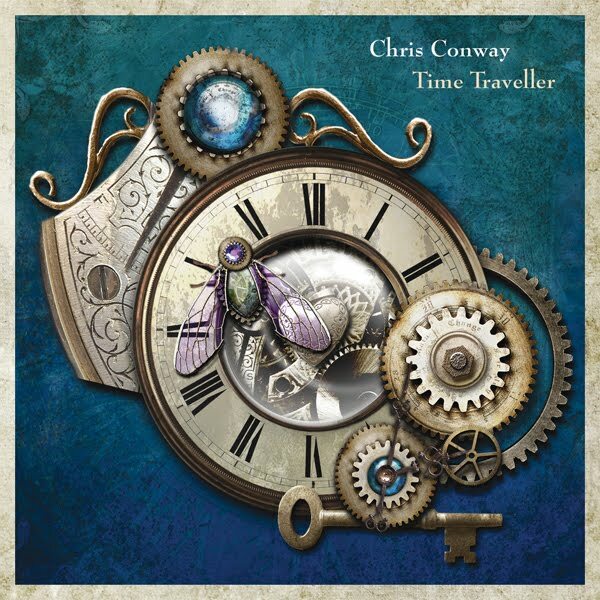 Vocal CD of the Month - "Chris Conway: Time Traveller"
Chris Conway's latest songs album is a mellow reflection on time - amongst other things. There are songs of time travel, wishes, love, madness, paranoia, parents, farewells, and more. It's brimfull with his big warm sound, harmonies and mellow lyricism. There is quite a bit of ground covered - piano ballads, Celtic folk, folk, jazz, bossa nova, even acapella. Instrumental CD of the Month - "Brubeck Brothers Quartet: LifeTimes"
Since the early 1970s, Chris and Dan Brubeck have performed and recorded frequently with their father Dave in Two Generations of Brubeck, the New Brubeck Quartet, and Trio Brubeck. 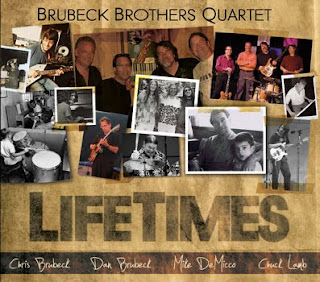 Now, on the Brubeck Brothers Quartet's new CD LifeTimes, they and "honorary brothers" Mike DeMicco (guitar) and Chuck Lamb (piano) have chosen to honor Brubeck père by reimagining a number of his best-known songs. "Dave Brubeck's music is rich with challenging chord progressions and beautiful melodies," says Chris. "Dave is one of the biggest inspirations in all our lives, and we all thought it was time to salute his compositions, adding the BBQ's fresh approach to some of his most enduring tunes." Those would be "Jazzanians," which first appeared on Trio Brubeck (1993) and was written in honor of the like-named multiracial South African student band led by eldest brother Darius Brubeck; "Kathy's Waltz," introduced on Dave's Time Out (1959) and named for his only daughter; "My One Bad Habit," inspired by a remark Ella Fitzgerald made to Dave ("My one bad habit is falling in love") and first sung by Carmen McRae on Dave and Iola Brubeck's 1961 all-star album The Real Ambassadors; and "The Duke," an Ellington tribute first recorded by Dave in 1955 and heard here in an arrangement with "a little bit of half time and double time from the first bar," says Dan, "with those grooves alternating throughout the track." Also included is Dave's biggest hit "Take Five" (composed by Paul Desmond), which Dan kicks off with a second-line New Orleans groove in 5/4, along with two originals by pianist Lamb ("Go Round," "The Girl from Massapequa") and one by guitarist DeMicco ("Prezcence"). LifeTimes, BBQ's fourth CD and their first since 2008's Classified, is the latest chapter in the brothers' near-lifelong series of collaborations. Chris (b. 1952) and Dan (b. 1955) benefited from early exposure to the family business: the Brubeck Quartet regularly rehearsed at the Brubecks' Connecticut home, and drummer Joe Morello would leave his practice set behind. "He let me bang around on 'em," Dan recalls. "I used his drums all through high school." Chris, who started on piano at age 5 and trombone in fourth grade, met Trummy Young, Louis Armstrong's trombonist, while Young and Armstrong were working with his parents on The Real Ambassadors and years later, as an adult, got to know Young. "He and Paul Desmond really shaped my ears," says Chris. In addition to recordings and performances over the years with their illustrious father, Chris and Dan have recorded together with pianist Andy LaVerne (for Blackhawk); made two albums with brother Darius featuring Larry Coryell; and pursued their own very different individual paths. 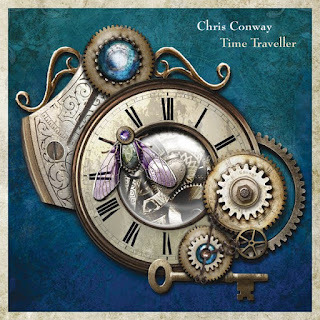 Chris, a self-taught arranger and composer, has had compositions commissioned and performed by orchestras around the world, including the Boston Pops, Baltimore Symphony, and Czech National Symphony Orchestra; he also tours and records with the blues-roots group Triple Play. Dan's résumé includes work with Coryell, Roy Buchanan, the Band, and the Dolphins, a group he co-founded with Mike DeMicco. Mike and Chuck Lamb first played together 30 years ago in Chuck's fusion group, Dry Jack. The intertwining pasts of the BBQ have helped them to forge a unique musical bond. On 9/12, the Quartet will embark on a two-week tour of Russia, co-sponsored by the U.S. State Department. The group will be performing by themselves as well as with the Russian National Orchestra (at Tchaikovsky Hall in Moscow) and with various guest artists including saxophonist Igor Butman, flutist Maxim Rubstov, and trumpeter Vladislav Lavrik. At the Tchaikovsky Hall concert, on 9/17, the group will perform selected tunes with the Orchestra, and Chris Brubeck and Vladislav Lavrik will play Chris's trumpet and trombone concerto, From the Blues to Beyond. Other dates include: 9/14 Igor Butman Jazz Club, Moscow; 9/19 Town Hall concert, Efremov; 9/21 Music School concert, Samar; 9/22 Moscow Conservatory Great Hall; 9/25 Mariinsky Concert Hall, St. Petersburg.